The rapid emergence of China’s economy is historically without parallel. As a result of the past two decades of expansion, China now accounts for more than one-tenth of the global economy, and has become the world’s second largest economy. While the Asia-Pacific region will contribute nearly one-third of the world’s GDP by 2015, the dominant contribution will come from China. While concern has been raised over the slowing rate of economic growth, one fact will prevail: China will remain the growth engine for the world economy for the foreseeable future. As China attempts to rebalance its economy towards a more sustainable growth pattern that puts a greater emphasis on domestic consumption, we anticipate many cyclical and structural changes and volatility. However, a hard landing is unlikely. 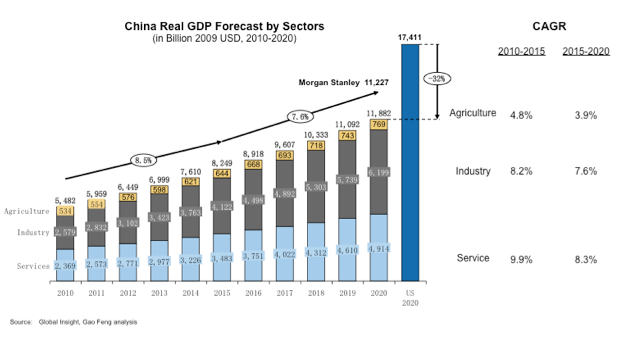 Analysts are expecting China to continue to grow between 7% and 8% annually through 2020 (see Figure 1), with continued strong growth anticipated in the industrial and service sectors. For 2015, and beyond: As the picture for the global environment becomes clearer, China will continue to struggle with the challenge of having to meet its pressing social and developmental objectives while experiencing GDP growth of ‘only’ around 8.0% through 2015, well below the rapid expansion seen in the recent past. Maintaining this growth will require a plan to mitigate risks particularly with regard to inflation, trade protection, currency revaluation, labor supply/cost and rising geopolitical tensions in the Asia/Pacific region. Despite these difficult challenges, China is likely to maintain strong growth driven by a mix of continued (albeit more selective) fixed-asset investment, and growth in consumption. Continued investment in infrastructure to support a >60% urbanized population is anticipated. Household consumption levels will rise as a result of the growth in the population of middle-class wage earners and rising incomes. A broad transformation is expected to continue and will present an environment that is characterized by a long term and sustained shift towards a middle-income, consumption-based economy. This trend appears firmly entrenched, representing a profoundly different new economic landscape and a continued shift in the balance of global economic power. Trends and discontinuities in the political, social and economic landscape will shape China radically by 2025. While the outlook is positive, the path could see some bumps along the way. Companies need to anticipate these changes to build in flexibility and resilience as part of their horizon scanning.